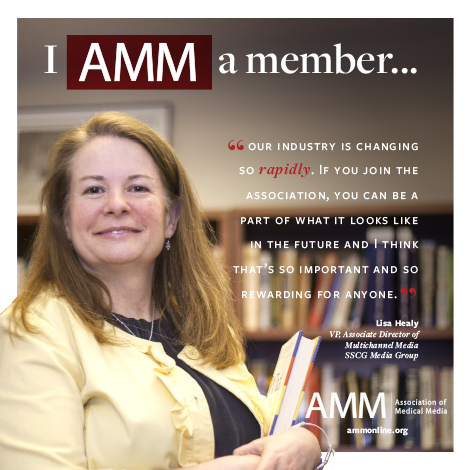 The AMM provides forums and resources for advancing professional medical media by establishing best practices, research and innovation through deep collaboration with a fully engaged diverse media community. Membership benefits include access to proprietary information, relevant education sessions, professional development and valuable network opportunities to address constant change while advocating for the growth and future of medical media. Stay connected and up to date with AMM and the industry through LinkedIn, Facebook, Twitter and AMMNews (our monthly newsletter). Attend AMM’s timely, practical, relevant and action-oriented face-to-face education meetings and Nexus Awards. Join us in person, view our presentations online after the event and look for breaking news on the website. Take advantage of one of AMM’s greatest benefits – Involvement. Have your voice heard by staying engaged personally by attending meetings, joining committees and contributing suggestions. Volunteer and get the most out of your AMM membership by developing professionally and having fun at the same time. For information on volunteer opportunities, contact AMM at [email protected]. Have a position to fill? Use the AMM Career Center to target medical media professionals throughout the industry and search resumes online. Looking for a job? Search the online job bank for current positions. Need resume and interview tips? Go to the career resources center for information on these other career coaching options.